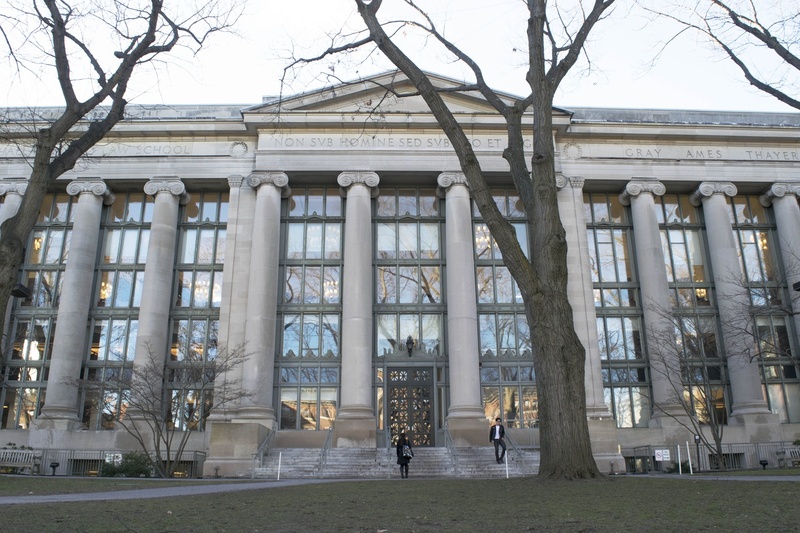 The Harvard Law School library at Langdell Hall is open to all Harvard ID holders normally, and only to Harvard law affiliates during exam periods. Harvard Law School celebrated its bicentennial last year, but women were not fully included in that history for more than a century. The first class of women graduated from the school in 1953 — and 65 years later, Law School alumnae, students, and professors gathered last Friday and Saturday to celebrate the anniversary. Dubbed "Celebration 65," the two-day program featured a variety of workshops, panels, and speeches from high-profile alumnae such as former U.S. Attorney General Loretta E. Lynch ’81 and the first woman president of Ireland, Mary T.W. Robinson. Three women from the pioneering class of Law School alumnae attended the celebratory events. Program events touched on topics of relevance to alumnae in both legal and non-legal fields, such as public interest, corporate law, local government, and the #MeToo movement. Elizabeth Papp Kamali ’97, an assistant professor at the Law School, wrote in an email that she was “heartened” to see many of her former classmates and commented on the great advances women have made in the past 65 years. “While 1953 seems like shockingly recent history, one recurring theme throughout the celebration was the incredible strides women have made within the law in the last half century,” Kamali wrote. Elizabeth H. “Betsy” Munnell ‘73, an alumna who now works as a business development coach and legal consultant, said the event left her optimistic the ways in which fellow alumnae are changing the legal field. While hundreds of alumnae returned to the event, student turnout was lower. The event cost $50 for students, and event organizer and Law School alumna Anne C. Weisberg said the timing of the event and confusion over which events students had to pay for may have led to low student involvement. Weisberg she hopes to engage with current students more in future celebrations. “I had no idea that there were so many accomplished women coming out of Harvard Law School and it was a really great opportunity to meet those women and network with them, and I wish that there had been more students there because I think it was such an amazing opportunity and I think that so many students just did not know about it,” Prager said. Prager also said she believes the attendance cost played a factor in the low student turnout. “I think the cost of attending for students was a bit prohibitively expensive so I think that stopped a lot of people from attending as well,” she said. Law School Dean of Students Marcia L. Sells wrote in a statement that “students were involved in every step of the process” and “forg[ed] connections” with many of the alumnae. “Exceptionally accomplished alumnae across many fields and many generations gathered with HLS students, faculty, and staff to learn together, to address hard problems, and to find in one another collaborations and inspiration for the work that lies ahead,” Manning wrote.